If using classic crust: Heat oven to 425°F. Spray or grease 15x10x1-inch pan. Unroll dough in pan. Starting at center, press out dough to edge of pan. If using thin crust: Heat oven to 400°F. Spray or grease 15x10-inch or larger dark or nonstick cookie sheet. Unroll dough on cookie sheet. Starting at center, press dough into 15x10-inch rectangle. Spread tomato sauce evenly over crust. 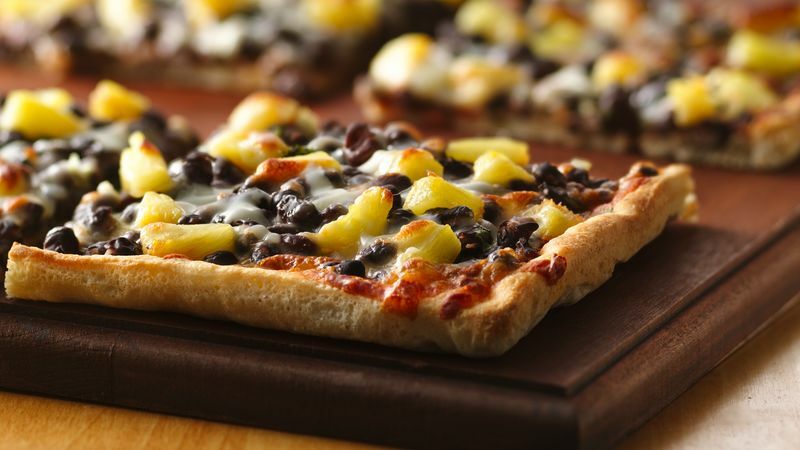 Top with beans and pineapple. Squeeze lime juice over toppings. Top with cilantro and cheese. Bake classic crust 12 to 15 minutes, thin crust 11 to 14 minutes, or until bottom of crust is deep golden brown. Cut into 6 servings. If desired, 1 cup (4 oz) chopped 97% fat-free smoked turkey breast can be substituted for 1 can of the beans.